Overall size: 19 3/4" x 14 1/2"
A Lancaster from 61 Sqn, heavily damaged by German night-fighter attacks, heads to Dusseldorf during a bombing mission on the night of 3 November 1943. Although badly wounded, pilot Bill Reid and his crew pressed on to bomb their target before returning home. For his courage and devotion to duty Reid was awarded the Victoria Cross. Few aviation artists come close to Richard�s extraordinary ability with pencil and paint which is why his drawings are highly prized by collectors. 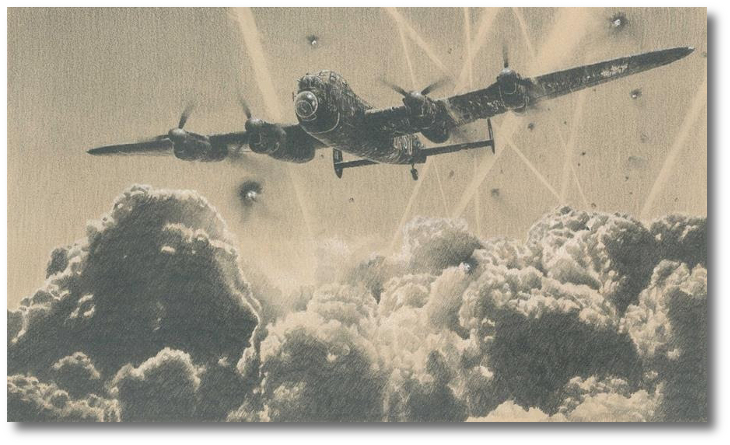 Completed in his trademark technique using a mixture of graphite with white highlights on buff colored paper, to create a unique 'sepia' effect, this stunning piece emphasizes the amazing standards which Richard has achieved.